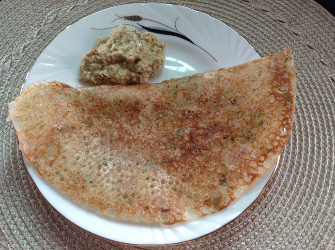 Instant Rava dosa recipe is a part of South Indian cuisine. Easy to make, it needs just four ingredients. It can be served at breakfast as well as any other meal. You will also find instant onion rava dosa recipe below. There are many varieties of dosa. Most dosa recipes need soaking, grinding, fermenting of ingredients such as rice and urad dal. This instant dosa recipe takes away all that hassle. You can have a dosa within 5-10 minutes. 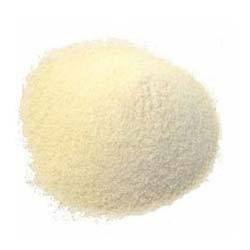 You may store this dosa batter in the fridge for 2-3 days and you can make dosa whenever there is a mood to have dosas. Have it for breakfast or dinner. Add rice flour, rava and maida (if adding) to a bowl. Add enough water to make a thin batter. Mix well with a large spoon or a beater. Make sure there are no lumps left. Add jeera/cumin seeds if adding. Add more water if needed. The consistency of the batter should be thin enough to spread on it's own. Your rava dose batter is ready. Keep aside for 10-15 minutes. The first one or two dosas will tell you if your batter is of right consistency. Heat a seasoned tava / nonstick flat pan. Once the pan is heated, keep the flame medium. Spread a little oil on the tava. Stir the batter and pour a laddleful of batter on the tava, in a thin layer. Pour the batter all over the tava, letting it spread on it's own or tilt the tava in circular motion to spread the batter in a circle. As the batter is watery, it should spread easily. If it doesn't spread easily, add a little more water for the next dosa. The dosa will form holes all over as it starts cooking. Let the dosa cook uncovered. It will start to brown at the bottom, which will be visible at the edges of the holes. By the time the dosa is lightly brown at the bottom, the top of the dosa will also be cooked, (it will change color from pure white to dull white). There is no need to flip it and cook on the other side but if you wish, you may cook the other side for a few seconds. Take out on a plate and serve immediately. Rava dosa needs to be served hot and crisp. It will turn soft after sometime when it cools. Make all the dosas in the same way. Remember to stir the batter every time you take out a laddleful of batter as the rice flour tends to sit at the bottom. We need all the ingredients given above for rava dosa and also the ones given below. For instant onion rava dosa recipe use the batter as prepared above and add the ingredients given below. Mix well and make thin rava dosas as with the above steps. 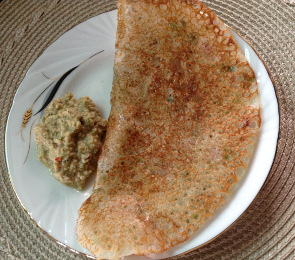 Serve rava dosa with coconut chutney or curry leaf chutney or any other chutney of your choice. 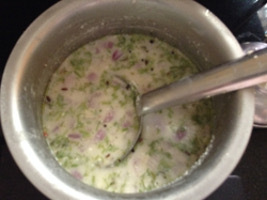 It also tastes good with curries such as vegetable saagu, veg curry , avial , potato saagu etc. You may serve a little ghee, butter or plain yogurt with this dosa. Serve it with your favorite pickle or dry chutney powder. If you like it, serve it with a favorite jam or marmalade. Make sure, the batter is not lumpy. This dosa does not stick to the pan when the batter consistency is right and the pan is well heated. If it sticks, check your batter consistency. You may need to add more water. Stir the batter before making every dosa. The rice flour tends to settle at the bottom of the bowl. You may or may not add a few drops of oil on the sides of dosa. Usually these dosas do not stick to the pan and do not need added oil, but the choice is yours. Oil adds to the taste. I like them golden brown. My daughter likes some added tomatoes too. Adding tomatoes may change the dosa color slightly.